You grew delicious, fragrant herbs all summer. They added an extra touch to your cooking, provided you with the ingredients for your own herbal teas, and filled your garden with fragrance. Once frost threatens, it's time to say goodbye to most of your herbs until next growing season. The good news is, you can bring many of these tender herbs indoors. Grow them in a sunny window, or under grow lights, and you can keep enjoying them for several months. You can easily dig up thyme, mint, oregano, and chive plants from the garden. Simply shake most of the soil off of their roots, and pot them up with good organic potting soil. Parsley can be trickier. It has a long taproot and doesn't take well to being disturbed. If you're planning to dig it up from your garden, dig deeply to get as much of the taproot as possible. Then re-pot with good potting soil, into a deep container -- eight to ten inches would be a good depth. Rosemary can be very finicky about temperatures. It does best in a bright window in a cool room. A south or east-facing window would be best. You can also grow basil fairly easily in a bright window. I don't recommend digging it up from the garden as you would with thyme or parsley, though. Instead, either start new plants from seed, buy a small plant to grow indoors, or take cuttings from one of your existing plants. The same can be done with lemon balm, mint, or shiso. Bright Light: Herbs do best with plenty of bright light -- at least eight hours of light per day. This can be provided by placing them in a south-facing window, but the more guaranteed method is to place them under plant lights. I usually place my herbs on the shelves I use for seed-starting; the lights are already there, and I have heat mats as well if the basement gets too chilly. Careful Watering: One of the trickier things about overwintering your herbs is maintaining the right moisture level. You'll want to water them regularly, but many herbs, such as rosemary and thyme, dislike soggy soil. The most effective way to figure out if it's time to water is to do the finger test: stick a finger into the potting soil. If the top inch of soil is dry, it's time to water. Watch for Pests: Before you bring them in, it's a good idea to check the plants thoroughly for pests and spray with insecticidal soap if you see any. It's also important to keep them separate from the rest of your plants for a few weeks, to make sure that any pest or disease problems they had don't get spread to your other plants. Once this initial period has passed, just check your plants regularly for insects, eggs, webs, or fungi. Be sure to look underneath the leaves as well–this is where many pests tend to congregate. 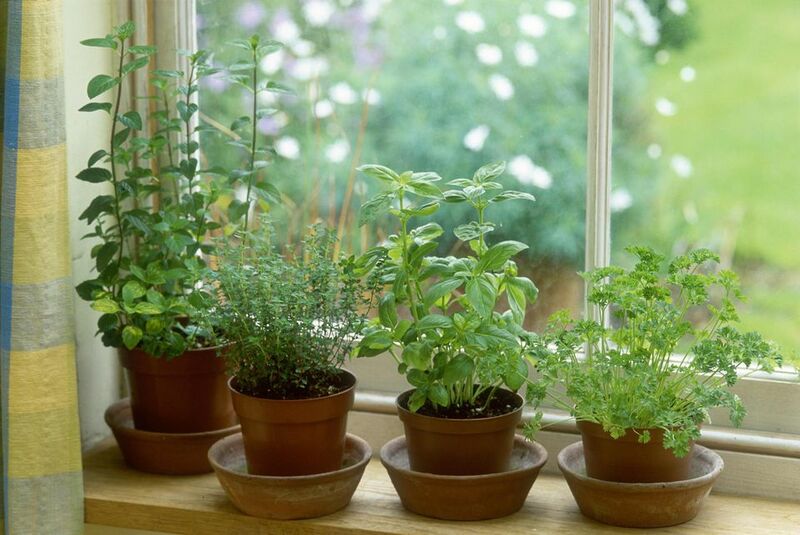 With these tips and a bit of attention, you can keep growing your garden herbs indoors during the winter!